Attorneys Robert L. Pellegrino and Michael A. Jefferson speak during the colloquium. 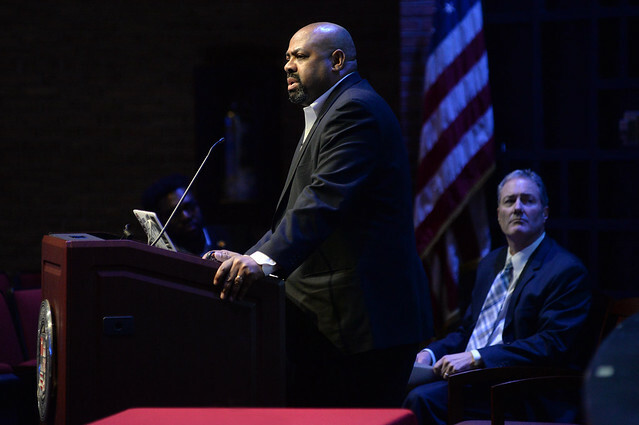 Hundreds of students, several clergy from various local denominations and Sacred Heart University marked Martin Luther King Day with a discussion on race challenges that elicited confessions and suggestions for progress in achieving the civil rights activist’s goals. The University’s Office of Mission & Catholic Identity presented the talk on persistent and ongoing race issues, which included provocative media clips, confessions and suggestions. Attorneys Michael A. Jefferson and Robert L. Pellegrino were the featured speakers, and they were introduced by students NaCyla Wiley, president of SHU’s Black Student Union, and Tatenda Zenenga, coordinator of the Jones-Zimmerman Academic Mentor Program. The event was part of the Human Journey Colloquia Series. Jefferson said he was inspired to be a “crusader” for social justice early on. His journey began with a realization as a young man that he was sexist after attending a gathering and hearing women speak of their oppression by men. He denied he was an oppressor at first, then rethought the issues over time and finally took ownership of it. At the same time, he acknowledged feelings of self-hatred, which resulted from negative imagery Hollywood and the media perpetuated about blacks. The mythic Tarzan, he suggested, was a heroic figure for whites, while blacks in the film series were equated with savages. It was that kind of negative correlation, Jefferson suggested, that has made blacks not want to claim their physical blackness; to disassociate from other blacks; adopt a European standard of beauty; question their own abilities; and commit homicide and fratricide in their own communities. Jefferson advocated a self-reform process not unlike his own, of admission and enlightenment. Pellegrino’s theme, geared to white audience members, was “My Journey from White Liberal to Anti-Racist,” and tracked with Jefferson’s story of gradual reform and advocacy. He confessed to growing up a sexist, racist and homophobe, with thoughts formed by “scraps of misinformation.” He said whites often become stuck with opinions and defend themselves by saying things like “I have friends who are black” and “I don’t see color,” phrases that don’t hold weight for Pellegrino. In fact, he’s written a book titled, I See Color: Identifying, Understanding & Reducing Hidden Racism, A White Perspective, which asks how can a person not see color, a defining characteristic of most people. He recommended self-examination, such as admitting the possibility of harboring racist sentiments; admitting to having blind spots when it comes to knowledge about race; reading; and establishing some form of metrics to gauge progress weekly or monthly. The event concluded with a question-and-answer period, raising thoughts from students and faculty about resolution and hope for the future.